Its Friday! Time to pull your mullet out of your baseball cap and let that glorious mane flow down the nape of your neck like pristine mountain glacier water running over smooth rocks. 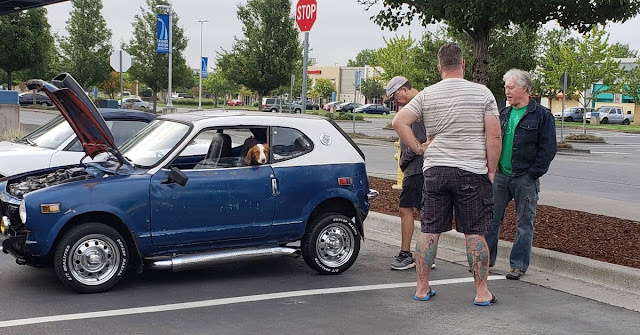 It is also time to put your daily driver to the side and drive that little beasty that has been sitting in your garage all week...yeah...you know...your 1972 Honda Z600 offered for $3000 somewhere near Portland, OR via craigslist. Tip from Rock On! Very fun. Very reliable. Micro attitude ! I show this car ! Wow does it get attention. If there happens to be a Lamborghini or Bugatti at the car show park this Honda next to them. You will get way more attention and save the $500k. "You" could show this car... Right Now! It is a 'car show' where ever you go! In fact, you WILL get tired of explaining the car to curious onlookers. This is a real 1972 Honda Z600 Coupe Microcar sold here in the US only for a two year production run. The Honda 600 is the 1st production car made by Honda Motor Company and was sold in the US., Portland in fact. This one is the sporty coupe version, not the boxy sedan. Incredible fun! Think Mad Max crossed with Micro Muscle Machine. This car is currently insured with Farmers Insurance and has clean Oregon title in my name. This car comes with functional dual chrome side pipes, ultra rare 110 mm bolt spacing 13" chrome wheels and new 175-50-13 series tires, a factory cable drive tach, a Top Fuel hood scoop and lots of patina. Yes it is almost 50 years old, it rattles, and creaks a bit. There is a spot of rust. The dash is cracked. The seats are worn. The exhaust has a nice rumble. This is not a Civic, or Accord, or CVCC. This car is NOT for everyone. Try to find another like it. In fact, try to find ANY reliable, fully sorted, running, and driving Microcar for this price! Go ahead try! This is a rare OHC, 2 cylinder, 598cc, air cooled, Honda Z600 Coupe Microcar tuned to 31 Hp. It is lovingly registered with Oregon permanent registration plates. This car has a dash shift 4-speed manual. It runs, drives, stops well. It is reliable. It will go 70 miles an hour if you are a crazy thrill seeker and mash the gas for 5 miles. The fuel tank, fuel pump, engine, and brakes have been rebuilt. The odometer shows 45k miles. It does NOT have VTEC, but its fun to pretend it does. It is a blast daily driver tending to needs. It is well sorted. The heater defroster and wipers work. Being an air cooled engine the heat is generated from the heat exchanger exhaust like a Volkswagen Bug. There are no exhaust or oil leaks to contaminate the heater and create stink. Most Honda 600s heaters have stink. I drive it in the winter and require a good defroster and wipers to be safe. This car sat for 20 years or more in a field right off Redland Rd. in Oregon City. Maybe you remember it? I saved it. I have been driving and enjoying it for the last 10 years. Field find resurrection!. No trades. No offers. The stated CASH price will transfer this car to you. I'm not interested in haggling. The price is firm. You either want it or you don't. It is a good deal and a classic and investment and will likely go up in value. Limited time offer. No other cars pictured are for sale. This car would be perfect for a ground up restoration or enjoy it as is. I have many videos of me driving this car on You Tube. You can watch a quick video clip here https://youtu.be/ER48uvjg2zo This Z 600 is a great driver ! I have had a dozen Honda 600's. I know them well. This is my third and last Z coupe. Originally this car came from the factory periwinkle blue, a somewhat rare color. I already sold the Orange Z and the Green GT Z coupe. If you see this ad as active this car is still available. Drive it home and enjoy it today ! The car itself is somewhere between mixed metaphor and frog in a blender but great ad! You ever seen a Honda Z600 Coupe on WEED! What did this poor Honda ever do to deserve this? But I am surprised that a 600cc Honda twin only puts out 31 bhp. That is pretty much what my 602cc Citroen 2CV puts out. This thing has real personality and that's why I dig it. The amount of rust visible and hidden is a bit frightening, especially on such a tiny car. For the price, play with it for a while and then send it on its way. First thing I'd do is remove the phony hood scoop. That's probably what's limiting the top speed. Well, that and 31 horsepower. Now I'm thinking that maybe I should put side pipes on my 22hp riding mower.